 Grapefruit and goat cheese crostini. Enjoy them with a glass of sparkling rosé (photo courtesy Fit Mitten Kitchen). Sliced red grapefruit (photo courtesy Fit Mitten Kitchen). 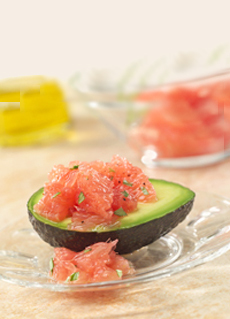 Fill an avocado half with red grapefruit, plain or lightly tossed with flavored olive oil or a sweet vinaigrette (photo courtesy Rio Star). 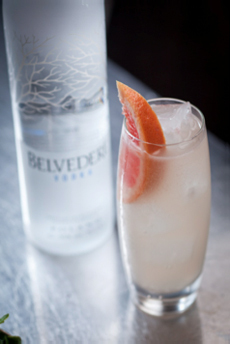 A grapefruit fizz (photo courtesy Belvedere Vodka). 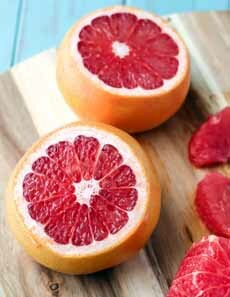 It’s red grapefruit season: the sweetest and most colorful of the grapefruit varieties. After tasting it, you won’t even want pink grapefruit anymore. Since then, it has been embraced even by people who don’t like tart white grapefruit. There are a number of different brands, such as Ruby Red and Rio Star. Bonus: The darker the flesh, the more antioxidants. You can read more about red grapefruit by following the links below. First, we tempt you with this delicious appetizer, an easy recipe from Fit Mitten Kitchen. Serve them with a rosé sparkling wine (Martini and Yellowtail are two of our favorite, affordable brands). Prep time is 20 minutes. Here’s the difference between crostini and bruschetta. 1. LINE a cooling rack with paper towels. Cut the grapefruits into segments: Here’s how to segment a grapefruit in 60 seconds. Carefully place the segments on the paper towels and set aside. 2. PREHEAT the oven to 325°F, or toast in a toaster oven. Slice the baguette on the bias, about 1″ thick. Place the slices directly on the rack and toast until lightly golden, about 5 minutes. When finished, remove from the oven and place on a serving tray. While the baguette is toasting, slice the avocados into thin slices. 3. 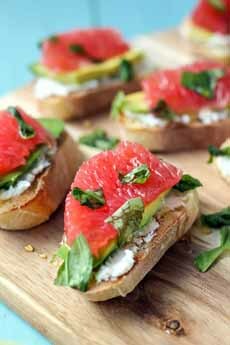 SPREAD about ½ tablespoon of goat cheese on each crostini slice, then layer on avocado slice, then the grapefruit segment. Rub the fresh basil leaves between your fingertips to release the fragrant aroma, then garnish the crostini. Add the optional honey and serve immediately.